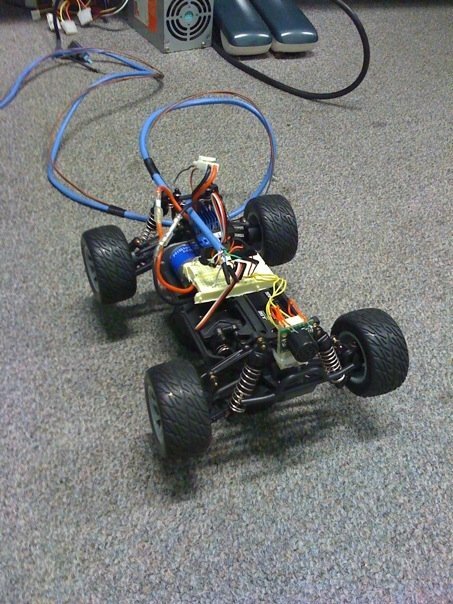 This is our hacked remote controlled car car built in the embedded systems design lab at Columbia, under the instruction of Prof. Stephen Edwards. The car is hooked up to an FPGA via an Ethernet cable. It's got an ultrasonic sensor on the front and is programmed to halt as soon as an object intersects its path. This car is uncrashable. Ironically, during development we were jerking the voltage levels too wildly and some transistors exploded. The car smoked.